Last Monday, June 16, No rth Georgia Brick started the brick stoop work for Brock Built’s Green House. 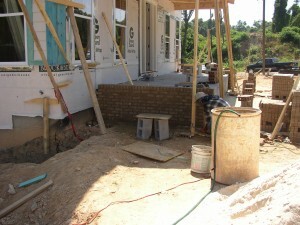 The slab work was completed on June 11, and North Georgia Brick seized the opportunity to deliver their bricks and get to work. North Georgia Brick is approaching its 25th anniversary, and in that time the company has become one of the leading brick distributors in the United States! The primary service area is in metro Atlanta, and the company contributes its nation success and continued growth to their unwavering commitment to meeting the needs of the customer. For the Green House, North Georgia Brick donated their time and product to help construct this amazing community service product. Children’s Healthcare of Atlanta and Brock Built cannot thank you enough for your contribution to this great cause that benefits the environment as well as one of Atlanta’s greatest non-profit organization. It’s not long now before this green built house is open for tours! This entry was posted in The Green House and tagged Atlanta community service project, Children's Healthcare of Atlanta, green built house, The Green House on June 23, 2008 by Carol Morgan.